For us as a modern, international service provider, our customer focus is of primary importance. More than 1000 experts in the TÜV AUSTRIA Group serve our customers in more than 300 areas of service expertise. Our custom-tailored services include the fields industrial services, testing, inspection, certification, IT security, management consulting, insurance services and training & further education. 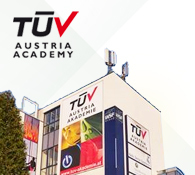 The international focus of TÜV AUSTRIA Group and its multitude of certifications (both national and international) prove TÜV AUSTRIA to be your qualified, safe and reliable partner. This brief brochure provides you, as a customer of the TÜV AUSTRIA Group, with an overview of our compre -hensive service portfolio. It also contains the number for direct access to our company‘s experts. Call us, or send us an e-mail. We look forward to a successful collaboration! The TÜV AUSTRIA Group was founded in 1872 and currently employs approximately 1,300 employees in 19 countries.